Many companies use this type of reconciliation in their cash flows statements. This type of reconciliation is occasionally found in published cash flows statements. Many companies use this type of reconciliation in their published cash flows statements. 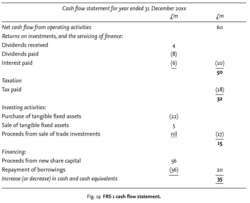 95, Statement of Cash Flows), a company that provides a set of financial statements that reports both financial position and results of operations should also provide a cash flows statement for each period for which results of operations are provided.